The Baltic Sea Basin is one of the world’s largest intra-continental basins, occupying 373,000 km2 and with a drainage area four times its size, and has served as depositional sink throughout at least the last several hundred thousand years. Its sediments comprise a unique high-resolution archive of the paleoenvironmental history of the huge drainage area, the basin itself and neighboring sea areas. The location of the Baltic Sea Basin in the heartland of the recurrently waning and waxing Scandinavian Ice Sheet has resulted in a complex development, characteristic for many glaciated regions of the Northern Hemisphere: repeated glaciations of different magnitude, sensitive responses to sea level and gateway threshold changes, large shifts in sedimentation patterns and high sedimentation rates. 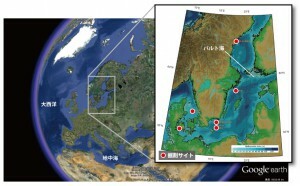 The high sedimentation rates (100-500 cm/1000 years) of the Baltic Sea Basin provide an excellent opportunity to reconstruct climatic variability of global importance at unique resolution from a marine-brackish setting controlled by e.g. changes in Meridional Overturning Circulation, the North Atlantic Oscillation and the Arctic Oscillation. The discovery of microorganisms in deep sub-surface sedimentary deposits, and even in basement rock, has profoundly changed our perspective on the limits of living organisms on our planet. Understanding the minimum energy requirements for growth and survival may offer a means of interpreting the distribution, composition, and activity of deeply buried communities. Can bacteria survive under extended periods of glaciation, maintaining complex functions at an energy flux that barely allows cell growth over many years? Are the deeply buried communities relicts of a time when the sediment was originally deposited, and if so do they then reflect past oceanographic conditions?